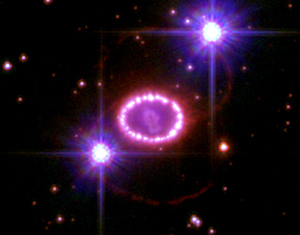 Supernova1987A -a core collapse supernova. 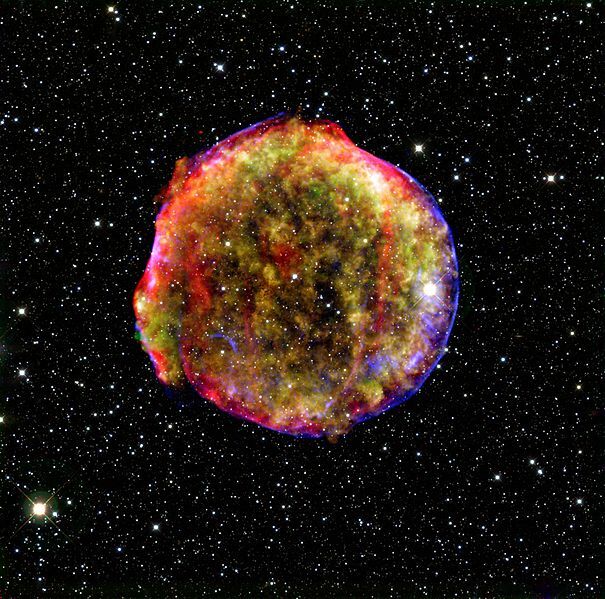 At the end of a star's lifetime the most massive stars blow up in a colossal explosion known as a supernova. The energy released from a massive exploding star can be more than the energy released by all the stars in a galaxy containing 100 billion stars. For a few weeks, a supernova may be visible to telescopes on Earth across distances comparable to the size of the Universe. 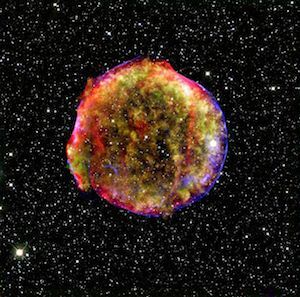 The events leading to a supernova are explained in this article, Core Collapse Supernovae, also known as Type II supernovae. Briefly, stars are big balls of (mostly) hydrogen gas. They are so massive that the pressure and temperature at their center is high enough and hot enough to cause thermonuclear fusion. reactions just like those that power the bombs in the world's nuclear arsenals. The energy produced by the fusion in the star's center creates a pressure that balances the weight of all the material above it. Eventually, after just a few million years for the most massive stars, the energy from fusion in the center begins to run out and the weight of the overlying material bears down on the core. The energy from the fusion reactions eventually stops and the star literally collapses in on itself and then much of the material 'bounces' off the center and gets launched into space as most of the star blows itself apart. Perhaps the most interesting CCSN to the modern astronomer are those that result in a collimated explosion that creates what is known as a Gamma Ray Burst (GRB). Energy from the explosion is delivered in two beams of high energy light waves or "gamma rays" lying along the star's original north and south poles. A typical GRB might release as much energy in a few seconds as the Sun will generate in its 10- billion year lifespan. Though ATLAS may not be looking at a GRB in the few seconds that it releases energy, many display an 'afterglow' that can last for minutes to days. We expect ATLAS to detect about 10 of these afterglow events per year which will help astronomers better understand the GRB production mechanism and their environments. Somewhat surprising is a particular type of supernova known as Type Ia (SNIa) that explode with nearly the same intrinsic brightness. Some appear fainter only because they are further away, not because they shine less brightly. These universal light bulbs allow astronomers to measure the distances to galaxies across the universe. ATLAS PI John Tonry was a member of the High-Z team recently awarded the Nobel prize in physics. The team used SNIa in the discovery of a "pressure" in the universe that causes distant galaxies to move apart faster than expected according to Einstein's theory of General Relativity. This pressure is now referred to as Dark Energy. We don't know what it is but the race is on to find out. To fully understand what supernovae are telling us we need to accurately know how bright they're shining. Just as not all 100 watt bulbs are exactly 100 watts, not all SNIas emit exactly the same amount of energy. This depends on what kind of star it was before the explosion, what kind of galaxy the SNIa lives in, and other "systematics." Such systematics are essential to our use of SNIa to understand the universe. To calibrate the systematics requires a large sample of bright SNIa, which is exactly ATLAS's fortet. Bright SNla can be examined in detail using spectrographs on big telescopes. Fainter SNIa are less useful since they are harder to observe, even with big telescopes. ATLAS expects to find about 300 SNIa per year with V magnitudes <17, and 30 with V magnitude <15! With this large sample of bright supernovae ATLAS will provide a treasure chest of shiny objects for detailed study by the biggest telescopes in the world. We think of stars as being fixed in brightness; the Sun that seems to shine on us, weather permitting, at the same intensity day-in and day-out. But many stars change their brightness regularly. They also suffer explosions that while not big enough to rip the star apart, may wipe out life on any planet unlucky enough to be in orbit around them. Novae are sub-critical stellar explosions that are still quite bright. ATLAS will be able to see all novae that occur in our Milky Way galaxy, in our neighboring galaxy, M31, and in other large and nearby galaxies like M81 and M101. Another type of explosive stellar fireworks are the cataclysmic variables. These explosions are not as big as novae but interest us from the perspective of understanding stars. There are about 2,000 known cataclysmic variables near the Sun and and there are probably more unknown. ATLAS will survey them twice every night; should any light up, ATLAS will send out an alert for followup by dedicated observers. Finally, many stars rhythmically change their brightness in predictable patterns. They are simply known as variable stars and have been known for centuries. Some stars change brightness because they expand and contract becoming respectively brighter and fainter. Others are actually two stars in orbit around one another and the apparent brightness of the pair changes as one star passes in front of or behind the other. Perhaps the best known example of these eclipsing-binaries is the star Algol where the change in brightness can be seen with the naked eye. On other stars, large "star-spots" on their surfaces rotate with the star and cause periodic changes in brightness. ATLAS will observe all the stars in the night sky every night so any star that changes in brightness will be seen. But there is still a place for amateur astronomers to regularly monitor the brightness of stars that are too bright to be accurately measured by ATLAS and provide many observations for detailed followup of particularly interesting stars.